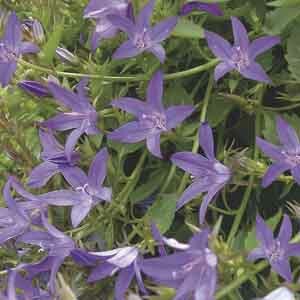 One of the best perennials for long-lasting interest. Fast-spreading plants cover themselves with light lavender-blue flowers. The foliage is heart-shaped and bright green. Drought tolerant. Perfect for pathway edgings, border fronts, and rock gardens. Performs well as a groundcover in smaller, contained areas of the landscape. Prefers fertile soil and generous amounts of water in summer. Keep on the dry side through autumn and winter. For best results, apply mulch in summer to help retain moisture. Remove faded flowers.